While you're here, why not check out Activities for Kids - Children's Book Week 2018? I have had so much fun making the PDF resources below to share with those of you who want to celebrate Children's Book Week with kids! They are free to download if you are a parent, teacher or librarian working with children. You will also find links to potentially useful resources I have found on the internet. + Here are two PDF posters I made that you might like to use to advertise Children’s Book Week 2018. One is black and white; one is colour. 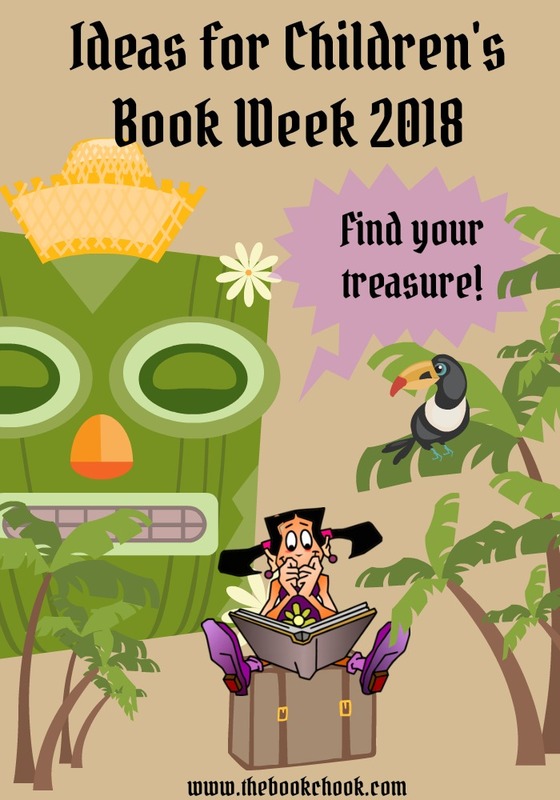 Download: Free PDF Posters for Children's Book Week 2018. + This year’s theme makes us think immediately of pirate treasure! A simple 2D display could be built with a pirate theme using clip art and other images, like these pirate masks from Learn English Kids. Children could create a background with individual seascapes or experimental blue patterns and then these could be joined up to make a background rectangle. Add a pirate ship silhouette with 3D curved paper sails on a kebab skewer mast. Add a 3D plank to the floor and a treasure chest for more effect. Make kids walk the plank before they borrow a new book! Personalise your display by adding school celebrities - dress a mannequin as a staff member or add cut-out printed photos of two school heroes seeking bookish treasures. 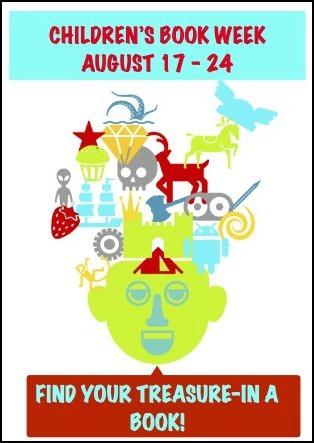 + Adults who love to get into the spirit of Book Week will be thrilled by this theme. Piratical costume ideas abound on the internet, but in the past I have made a very simple pirate outfit (last minute!) with a pair of old black pants I cut ragged at the knee, an old plain white t-shirt that I also cut ragged and a long scarf tied as a sash. Some pirate costumes have an attached toy parrot, but quirky pirates like me have also attached a carrot (“Miss, it’s supposed to be a parrot not a carrot!”) or a toy teddy bear! + Need a contest idea ? 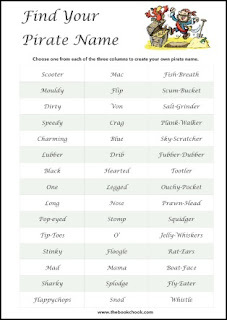 Choosing pirate names can be lots of fun for adults and kids. If you’re brave enough, run a contest to find the most popular pirate name for a librarian, principal or teacher. I just know there are adults out there longing to be addressed as Popeyed Von Salt-Grinder! You can download a Find Your Pirate Name printable PDF at my website. In my opinion, it’s suitable to use with kids, and lots of fun! Download: Free PDF, Find Your Pirate Name. + Although we want children to employ lots of different strategies to discover book treasures, sometimes a treasure can appear serendipitously. This Book Week, have children try out new books. How? Combine book dating and a chook raffle! Wrap the books you think kids will enjoy in plain paper. Add a numbered sticker to the front. Then have kids choose a number by some means - borrow the Lions Chook Raffle Wheel, make your own wheel, throw multiple dice, choose a numbered folded paper from a bowl - anything that adds an element of mystery and a modicum of suspense. Match the number to the book and volià! This could be done at home with one child and several books over a number of days, perhaps in a countdown to Book Week, through to a whole grade activity in schools. + Not up for a chook raffle? How about wrapping the CBCA books or other new books in colourful or pirate-y paper and then having kids unwrap and borrow one if they manage to achieve something eg a library, classroom or playground scavenger hunt. If the book is not something that appeals they might be able to give it to a sibling or friend. Every book is someone's treasure! + Use the idea of looking or searching to find something great. Build a display around a picture of a magnifying glass or a telescope, and consider showing some of the book covers of new books you want to promote. If you have the skills, add real drama by spotlighting the book cover display and turn the main lights off before classes walk in. + Consider a caption like: “Treasure a Great Book”. Treasure doesn’t need to be pirate-ish. You could think Indiana Jones, or Aladdin. A display area could be set up like a tropical island with long cardboard roll palm trees, a shipwreck or primitive idol backdrop, a treasure chest, and maybe some fishing nets and floats draped to the side. How about a dimly-lit cavern littered with treasure boxes and sacks? The sides of the “cavern” could be built from low walls made from actual (rejected or op-shop) books. A 2D display with a tropical or pirate theme could also feature book cover suggestions. My tropical clipart in the top image came from PicMonkey. + Challenge students to turn something that is not a pirate (eg a pumpkin, a teddy bear, a potato or a box) into a pirate with a favourite book treasure. Have standardised labels with spaces for student name, Pirate name (eg Captain Beartholomew, SpudBeard) and display them in a suitable space. + The Learn English Kids website has a printable pirate colouring-in picture where kids need to read the sentences and colour accordingly. + Lots of kids will have pirate and other LEGO at home. Why not challenge kids to a “create a LEGO scene” competition, with the theme being “Find your treasure”? 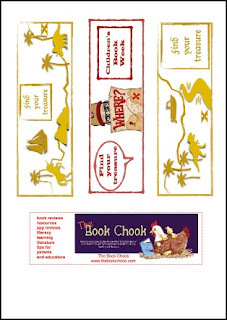 + I have created some printable treasure-themed bookmarks for Children’s Book Week 2018 that you can download on my website. 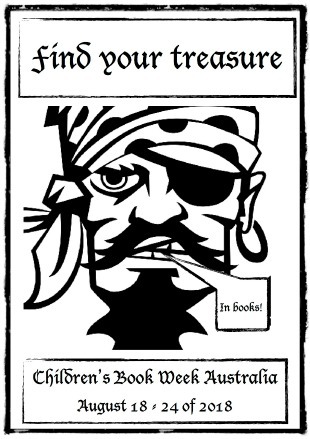 Download: Free PDF, Find Your Treasure Bookmarks. + If you only have a small space or one bookshelf, School Library Displays has a picture of a pirate-y bookcase. + There are some cute pirate finger puppets in a Treasure Island printable at Imagine Forest. + Need a rollicking pirate-themed song? Here’s a short animated Youtube video promoting the book Portside Pirates, and it features the song, Portside Pirates, which is catchy and fun. (Here’s the same video with lyrics on the screen.) Here’s another pirate song, this time with movements. Here’s A Pirate Went to Sea, Sea, Sea video with lyrics on the screen, and your students may know the hand-clapping game it goes with. Learn English Kids have a pirate song with printable lyrics, downloadable audio, printable sheet music and even an activity based on the song! + If you need an idea for a performance for Book Week, you could create a kind of dramatic “collage” with some children reading aloud short descriptions of their reading treasures, any pirate song, a group choral piece, an individual re-telling, or a reader’s theatre based on a picture book and perhaps another song as a finale. 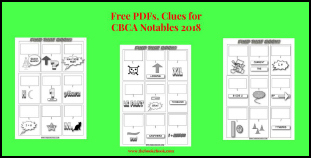 Download one, or all three: Free PDF, Clues for CBCA Notables 2018. + Here is a challenge to help kids become familiar with the titles of books in the CBCA Shortlist for 2018. 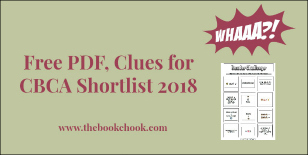 Download: Free PDF, Clues for CBCA Shortlist 2018. Last year, we looked at the idea of using escape rooms as a focus for children’s learning. Can we use a similar activity this year to generate enormous enthusiasm while kids practise their creative and critical thinking skills? Yes: treasure hunts! When kids realise that books can be treasure, the library makes a great venue for a treasure or scavenger hunt! But if your school sadly has no library, a classroom or other space can work too. I am sharing my ideas for three different hunts you could use to start off, then you could create clues specific to your students when you have time. This is basically a hunt for “hidden” objects and does not have much to do with books. It might be a fun one to use on a special day. For this hunt, you’ll need to bring in some common props. I’ve written some rhyming clues about easy-to-obtain items that you can hide in plain sight in the library or a room. I would also add other objects new to the room, just to be fiendish. Make it more fun by adding unrelated items like a shower cap, a mannequin dressed as a pirate, a shovel. Then you put “treasure chests” near the objects so that when kids locate each object, they collect one treasure chest for their team. Check out my website for more detailed directions and downloads. If you’re a parent, teacher or librarian who wants to remind everyone about Children’s Book Week, its free to download all the PDFs I share at my website. 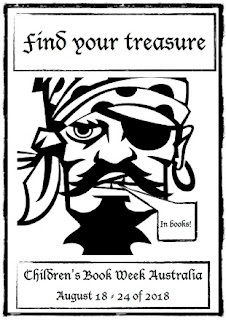 Download: Free PDF, Library Treasure Hunt - Rhyming Clues. This hunt will suit older kids. It is also about working out clues, this time in the form of riddles. If you have less time, kids could simply try to solve the riddles. If you have more time, hide objects that represent the riddle answers in your space too, and have kids locate them. Check out my website for more detailed directions and to download. Want to make your own treasure hunts? There are lots of easily adaptable ideas from the Lock Paper Scissors people about creating maps for a treasure hunt date. There are other ideas on the web about Treasure and Scavenger Hunts in Plan a Treasure Hunt for Kids, How to Make an Amazing Treasure Hunt for Kids and Create a Scavenger Hunt. # How can we go about finding books that we will treasure? What are ways of discovering or tracking down awesome books? Brainstorm a list of ways with kids. Consider: watching book trailers; asking a friend; starting a book club; browsing in the library, a store or at a book fair; checking out new books on a bookstore or publisher’s website; finding more of a favourite author’s books; searching at sites like What Should I Read Next? ; deciding on a genre you like and searching that way; asking for recommendations from an adult who knows a lot about children’s books eg book reviewer, librarian, book store person. # Invite kids to try some or all of the methods above and record a book title to match each method listed on the page: “I found my treasure by …” It’s in the 3 page booklet I have made for Children’s Book Week 2018. Inside the booklet you’ll also find a Buried Treasure map game for kids that uses a grid and co-ordinates a bit like battleships. The booklet is also included in my Activities for Kids - Children’s Book Week 2018, coming Friday. Download: Free PDF, Book Week 2018 Booklet. 2. Children’s Book Week also makes a fine time to introduce children to genres. Lots of readers prefer one or more genres, and that can be another method of finding books as many libraries and stores have genre labels. # What kinds of books do kids like to read? A special style of book is often called a genre, and genres can include Mystery, Science Fiction, Graphic, Adventure, Humour etc. The next activity asks kids to put a circle around each genre they try on the map in the PDF, Find Book Treasures. Up for a challenge? Try each genre on the map and record each book’s title. Download: Free PDF, Find Book Treasures. 3. Looking for a way to incorporate some technological tools into your Children’s Book Week celebrations? Kids could make a word cloud of their favourite genres or titles at ABCya Word Clouds and share these with a friend. Remind children to use tilde (~) between words that must be kept together, and go to Menu/Save to download the image to their computer. A word cloud or multiple word clouds could also make a colourful focus for a display and thus have the potential to reach a wider audience! Keen to find even more ways to help kids discover new treasures to read? You might like my PDFs, What to Read Next? and Is this Book Right for Me? in Tips for Helping Children Select Books. Check out all my children’s book reviews here or on Pinterest. Aussie author, Tristan Bancks, has ten great ideas for Book Week 2018. In my next article, Activities for Kids - Children’s Book Week 2018 , you’ll discover even more goodies aimed at helping kids discover book treasures and have fun with books and the theme! You’ll also find my Children’s Book Week articles from earlier years in the list below.